way out west: Beer time! Grozet lagered Celtic ale... 5% abv. 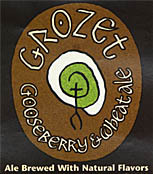 This beers name comes from the Gaellic ‘Grozeid’ or gooseberry. Monks in Scotland added fruit to beer as early as the 16th century. A famous historical gooseberry beer was Tibbie Shiels green Grozet enjoyed by Walter Scott and Robert Burns. The beer is brewed with lager yeast, Bog Myrtle, Meadowsweet, gooseberries, Wheat Barley Malt and hops making it a distinct and unusual drink. It is a dry fruity wheat beer refreshing and light. Great to finally meet up face-to-face...looking forward to other opportunities in the future. The Grozet was good. Still not sure I have any frame of reference as to how the bog myrtle impacts upon the gooseberry taste! Hi Mark! Thanks for linking me on your blog! Always an honour… Hope the beer was really good. If you come over to germany you might be in for a treat, also. We are kind of proud that way, but most people like our beer… :-) Cheers!